Today will be one of those days where you’ll be justified in saying “if you don’t like the weather in New England, wait 5 minutes”. We’ll run plays from each season’s playbook, ranging from winter’s freezing precipitation this morning to springlike highs near 60 to summertime thunderstorms to fall’s howling NW winds. Because there’s so much going on, this update will be a little more detailed than usual. We’re on the northern side of a warm front this morning, and low level cold air is well entrenched on the eastern side of the mountains. While it is April, and this process means temps in the mid 30’s and drizzle for places like Portland, freezing rain is falling in the mountains where temps are below freezing, something that will continue through the morning hours. While no major ice accretion is expected, it only takes a glaze to make surfaces extremely slippery. The threat from freezing rain will wane as the warm front aloft moves north, temporarily shutting off precip midmorning. Temps just off the ground will soar well into the 40’s and low 50’s today, which would support surface temps in the 50’s to low 60’s if we could get some of that air to the surface. The big question for determining the extent of warm temps today will be how much southwesterly flow we can get ahead of the cold front. Southeasterly flow will keep cold air dammed against the mountains, but there are no mountains to our northeast. If we can get southwesterly winds to develop near the surface, we’ll be able to kick some of that colder air out, and allow some of those warm temps aloft to mix down, which would result in at least a couple hours of lovely spring weather. The best chance for this, as always, will be in southern NH. 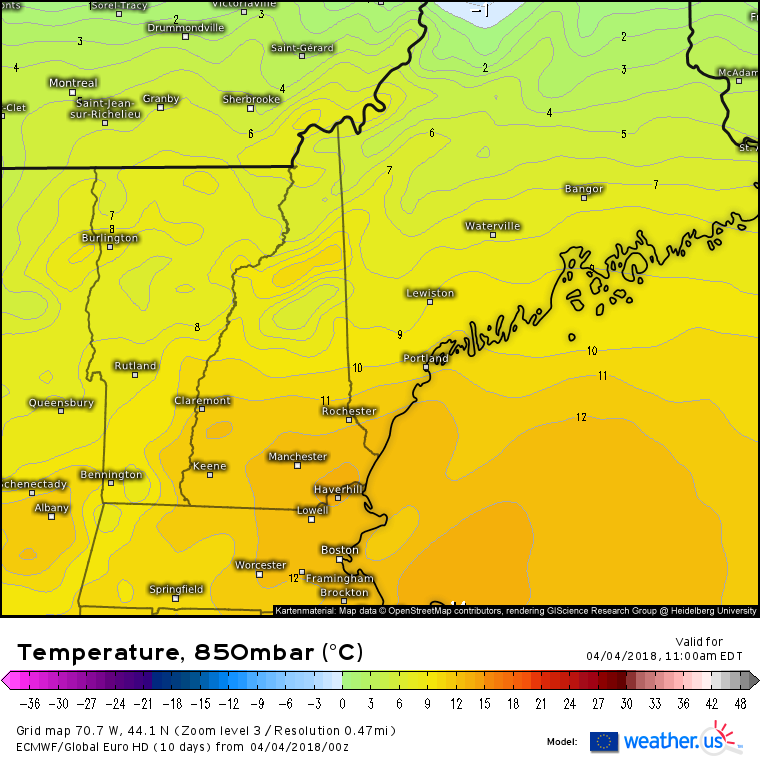 Warm temps are least likely in the Farmington area where cold air damming is notorious for holding on to the bitter end. Once the cold front passes through, the turbulence associated with it will help briefly mix down some of that warmer air before temps really begin to drop behind the front. As the cold front approaches, we’ll move towards our next season’s weather: thunderstorms resembling those we typically see in July. This simulated radar loop from the HRRR model shows some storms developing along the cold front this afternoon, especially in southern parts of ME and NH. Thunderstorms need three ingredients to develop: instability, lift, and mid/upper level winds. We are checking two out of three boxes without question today as the strong cold front provides the lift and howling mid/upper level winds associated with the front are present aloft. Instability will be the limiting factor today, because there won’t be much of it. Certainly not enough for a severe weather threat, but I do think there will be enough for a few rumbles, especially areas south and east of a Fryeburg-Augusta line. We have one more season left in the rotation to get to before the day is done today, and that’s fall. 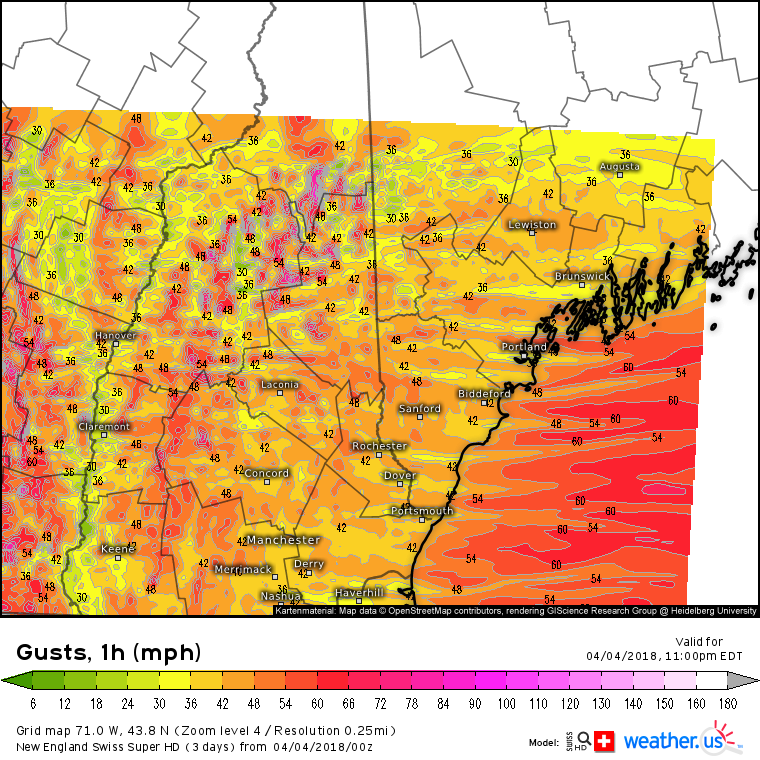 One of fall’s defining traits in ME and NH is its strong westerly or northwesterly winds. How refreshing those feel after an August spent sweltering in oppressive humidity! Today though, dropping temps behind the front won’t provide any welcome relief, but the winds bringing those cooler temps in will become strong enough to cause problems. Gusts over 40 mph are expected across the entire area, with gusts over 50 mph expected in the mountains. The higher elevations of the mountains will see gusts even higher than that. These wind speeds will be strong enough to cause power outage issues, so be prepared for that threat before you head off to bed tonight. The worst of the winds will be during the overnight hours, before they taper off tomorrow morning. Enjoy the weather today, there’s something in the forecast for everyone!